Both events are free. 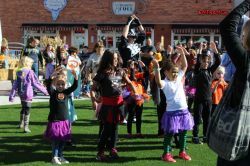 Children and parents are encouraged to wear costumes, bring their own trick-or-treat bags and meet at Main Street Square, where they may pick up a map of participating Downtown businesses. Tons of ghostly family fun at Main Street Square, then Downtown Trick-or-Treat from 1 to 3 p.m.